CAROLINELEAVITTVILLE: Lesley Poling-Kempes talks about Bone Horses, her love affair with the high desert, being haunted by story, and so much more. Lesley Poling-Kempes talks about Bone Horses, her love affair with the high desert, being haunted by story, and so much more. There is something about a novel that exists in a terrain that's completely foreign to yours. 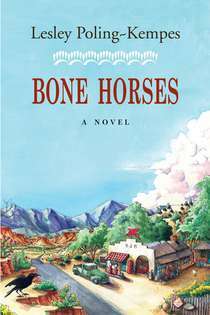 Lesley Poling-Kempes' novel Bone Horses inhabits the Mexican high desert--and it's a stunner. Lesley is also the author of Canyon of Remembering, Valley of Shining Stone, The Harvey Girls" Women Who Opened the West, and Ghost ranch. I'm thrilled to be interviewing Lesley here on the blog. Thank you, Lesley! What sparked the novel Bone Horses? My love affair with the high desert of northern New Mexico, a love that began when I first came to Ghost Ranch on a family vacation as a child in the 1960s. Like my BONE HORSES protagonist, Charlotte, I was born and raised in New York, specifically in Westchester County. 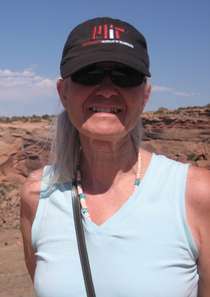 Unlike Charlotte, I loved the wild vast empty desert and wide blue sky of the Southwest on sight. I was always working my way back home to this exotic, magnificent place. After college I moved full time into the Indio-Hispanic world of Abiquiu. I began to write the real and imagined stories of my adopted community, first in non-fiction books (I had to come to terms with a thousand tedious footnotes!) that brought me some success as a writer and historian, and then in my first novel Canyon of Remembering and now Bone Horses. For several decades my primary work was as a writer/historian. For my first 3 books (The Harvey Girls, Valley of Shining Stone, and Ghost Ranch) I interviewed and talked with literally hundreds of old-timers all over the Southwest. I heard remarkable tales of the early days in New Mexico, Colorado, and Arizona. Sometimes a story haunts me, moves into my heart, and kindles the fires of my imagination. I knew the moment I heard the story of the wild horses of Ghost Ranch and the Shining Stone basin that I would write a novel that incorporated the tragic story of these long-ago mustangs. During the Dust Bowl the federal government, hoping to somehow save the last bit of grass on the high desert, ordered the removal of the wild horses that roamed the canyonlands. Sharpshooters waited by the watering holes and shot down the horses when they came in to drink. Their skeletons littered the desert for years – the same years, the 1930s, when artist Georgia O’Keeffe first came to Ghost Ranch and began to immortalize this same landscape and its bleached horse bones in her paintings. I wondered what the loss of that wild herd did to the psyche of the local community. I began to think about how the history of a place is fashioned by what people choose to remember. About how what we come to accept as the real story is unavoidably shaded and shaped by the subjectivity of emotion and memory. History often includes partial truths, and sometimes outright lies. What if a family’s story was built upon half-truths or complete falsehoods? I wondered how our personal history, our sense of self, sense of our place in the world, could be substantially altered if we did not have the complete, unedited story of someone we loved and lost as a child. These themes became the foundation for Bone Horses. The novel takes place in the late 1990s in the fictional town of Agua Dulce (Sweet Water) at the edge of the Apache Reservation on the high desert that is the New Mexico-Arizona border. I wrote about a place and people I would like to know: self-reliant cowboys, spirited Apache curanderas, Harvard paleontologists, phantom horses, and Charlotte, my proper Scarsdale schoolmarm who reluctantly visits New Mexico and accidentally unearths the long-buried story of her mother’s death. The truth is painful to excavate, but it can and does set Charlotte free. A book of non-fiction (that means more of those tedious but necessary footnotes!) titled Ladies of the Canyons. This mostly untold bit of mostly true history chronicles the lives of four women friends who came into the hinterlands of the Southwest from Boston and New York before World War 1. Single spinsters in their thirties, these intrepid women left the safety of family, home, and familiar hearth to embark on adventures and misadventures in the deserts and mountains of New Mexico and Arizona. Lots of great photographs. The book is under contract with the University of Arizona Press, due for release in 2015.